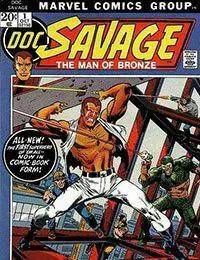 Comic book version of the classic pulp magazine hero Doc Savage. Issue features The Man of Bronze, part one of an adaptation of the Kenneth Robeson novel of the same name in which Doc and his team try to track down who killed his father. Issue also has a one-page text feature on Doc Savages team members. Script by Roy Thomas and Steve Englehart and art by Ross Andru and Jim Mooney.